Please welcome Sean Danker to The Qwillery as part of the 2016 Debut Author Challenge Interviews. Admiral was published on May 3rd by Roc. Sean: Not that long ago. I actually didn't have a say in it; I'm the last descendant of an ancient race of writers, and my ghost ancestors hassled me. Like in Mulan. They want me to travel the globe and find the secret entrance to the ancient lost writer city. So you could say there's some pressure. Sean: I'm pretty good about having a full outline these days. Sean: Sticking to one genre. TQ: Describe Admiral in 140 characters or less. TQ: Tell us something about Admiral that is not found in the book description. Sean: It's safe to take on an airplane, and your ghost ancestors will love reading it over your shoulder. I guarantee it. TQ: What inspired you to write Admiral? 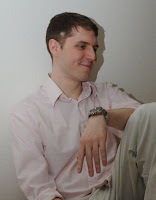 Sean: Given my level of nerd street cred, I was long overdue to do something with space. TQ: What sort of research did you do for Admiral? Sean: I'm in the dim basement of a crumbling, gothic, downtown library, hunched over a microfilm reader. There's a storm, and you can hear the rain pounding on the building. My glasses are on the table next to a scrap of bloody cloth, and a piece of stone covered in mysterious carvings. One of my Mr. Rogers cardigans is draped over the chair. The lights flicker, and somewhere in the basement a door slams. I sit up and look back at the door. There isn't supposed to be anyone else here. A moment passes, and something rattles down the hall. I look up; there's a sound, like something heavy being dragged across the floor above. I put put on my glasses and pick up my flashlight. Something isn't right. Like that. All my research is just like that. Sean: The easiest was Deilani because she's direct. The hardest was the Admiral because he's not direct; everything he says means something, and that foreshadowing has to line up with all the twists throughout the series. TQ: Why have you chosen to include or not chosen to include social issues in Admiral? Sean: Social issues are the focus of my work, so I don't really include them; they're already there, I just include some fiction. TQ: Which question about Admiral do you wish someone would ask? Ask it and answer it! Sean: Q: Can I buy a billion copies? A: Yes, but just this once. TQ: Give us one or two of your favorite non-spoilery quotes from Admiral. 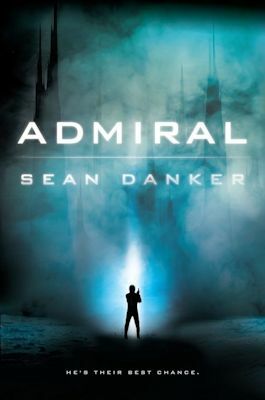 The Admiral: "You shut up,"
Sean: Plenty of novels. I might also track down that lost city, but I have to reconcile with some exes and get the okay from my therapist first. Sean: Thanks for having me.